Ever wish that real life wasn't so ... real-lifey? Why, it sounds like a party already! And this cake is a party for my eyeballs; check out those edible ink illustrations pulled straight from the book! Fantastic. Tweedledee and Tweedledum! (Way way waaaaay cuter here in fondant - sorry, Tim.) And could that Queen of Hearts BE any more Helena Bonham Carter? So much detail. I love that the platter goes along with the theme, too; kinda would have ruined the effect to plunk this masterpiece down on a Chinet. Sheer madness! But the best cakes usually are. Oh me, oh my, are we done already? No, don't worry your little pink nose, we still have much more muchness to see. ... looking dapper in his party finery on this hand-painted cookie, which sounds exactly like something you'd eat at a Wonderland tea party. You just might lose your head. Still, it's a beautiful effect on a cake! Amiright, or amiright, Your Majesty? Ooookay. Nevermind. Love the dress, by the way! That collar is killer. ... but not without taking a minute to give a hand to this baker and his/her subtly stunning cake. Teacups and mushrooms and pocket watches, oh my! Just wonder-full! Aww, I'm not ready to leave! Do you think we can go to to Neverland next? Have you made a cake you think we should feature on Sunday Sweets? 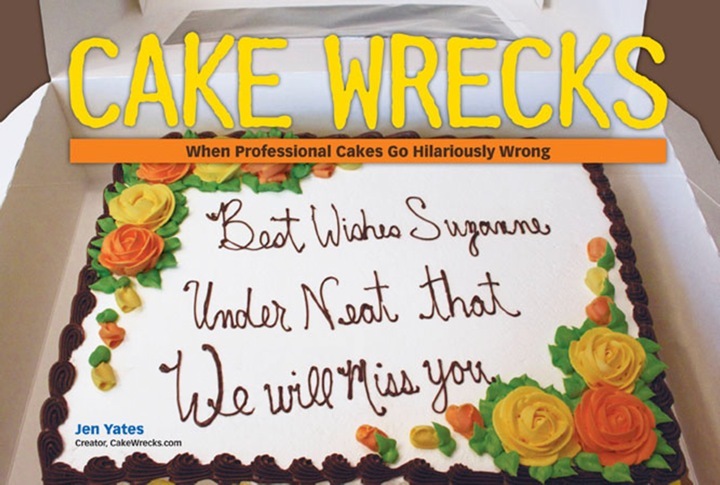 Then please, send it to Sunday Sweets [at] Cake Wrecks [dot] com. And as always, be sure to watch for our daily updates on Facebook! Every week I think the cakes can't get any better, yet they do - incredible this week! Fun! But there's no Hatter on the combo (5th) one. Same here, having a hard time choosing a favourite. Being a fan of less is more, I'd probably choose the second and the eleventh ones (and that cookie!!) but the others are just equally amazing. Just one thing about the Chesire cat on the last one... Don't ask me why but I thought of Rick James when I saw it. July 28, 2013 | M.
I also love the handpainting of the original illustrations. I believe I like the color combination of the washed pastels of the second and second to last cake. While Disney's and Tim.Burton's interpretation have Wonderland as loud and bright, I think the muted pastels reflect the era of when the book was written. All of these cakes, though, are beautiful. Such stunning cakes! They make me want to go and re-read the book...which I shall do now..... Thank you! I love the next to last one the best! The dormouse was always my favorite. OMG! the Johnny Depp on the Tim burton cake is spot on! And the one with the teacups and pocket watches. These are just plain amazing!! These are splendid!!! . . . just wondering, how do copyrights apply to images in cake? Artistic freedom or royalties? -- if royalties, how computed? . . . and if you don't pay, off with your head? or top layer? Oh wow! These are all beautiful, though I'm seconding the adoration of the one with the book illustrations. And I like the last one with the Mad Hatter peeping out too. :D Wonderland in cake form can not go wrong! Also, you should do not only Sweet Neverland, but also Sweet Oz. Might as well hit all the big three on your vacation! I have an Alice in my life, and yes, she lives in Wonderland. Thank-you for these. 11th one down: It's crazy-amazing how they achieved such a gossamer,filmy effect with that little scrap of green lace/crochet on the top of the cake, just under the teacup. There's even writing and bits of illustrations on that layer. Just amazes me to the zTh degree. I just call it doodling-without-a-pen! I get a lot fancier when I doodle with an actual pen or pencil in my actual hand (and for me, it's more fun, and more "free form"). it says "evdokya, its you day of birth"
Okay, I won't ask! I'm getting more of a "Whoopie Goldberg-meets-Alfred E. Newman" vibe, myself. I don't know whether to be disappointed or relieved that the American McGee interpretation is not represented here; why, one based on the second game could RUIN your appetite! This was the exact stress-release I needed right now! Anything Wonderland related just makes me so happy. Thank you, Lindsey! "Alice in Wonderland" and "Through the Looking-Glass" are two of my favorite books of all time, so a "Wonderland"-themed Cake Wrecks post is doubly awesome. July 28, 2013 | Paul W.
The rose on that second one...how beautiful! It's three dimensional yet looks like its painted! There is a little known book series that is a phenomenal Steampunk-esque take on Wonderland called "The Looking Glass Wars." I think it is a must read for any sci-fi/fantasy fan. For instance, the Mad Hatter is a bodyguard named Hatter Madigan whose top hat becomes a weapon and Alice is the royal princess. @Arlene: Precisely why the legendary Grace Slick wrote the song "White Rabbit"; she was like "Hey, hold on here Grown Up Types-- YOU read us stories FULL of drug references, how can you be surprised at our antics?!" Allow me to take the Alice-themed opportunity to bust Jen's stones about her Steamy White Rabbit Costume. Stay off the Interwebz all you need, but for Bowie's sake, don't leave us costumers hanging-- we wanna see it! I LOVE these books! Frank Beddor rocks! I heard about them from a blogger friend and tracked them down. They are so vivid and imaginative. I love how they travel via the Pool of Tears, the descriptions of the card soldiers and the caterpillar oracles. A thoroughly wonderful romp! Because what fun is there in making sense?